1. What and when is the sales tax holiday? A one-time sales tax holiday to occur only in 2015. The holiday starts on Friday, August 7, 2015 at 12:01 a.m. and ends on Sunday, August 9, 2015 at 11:59 p.m.
2. 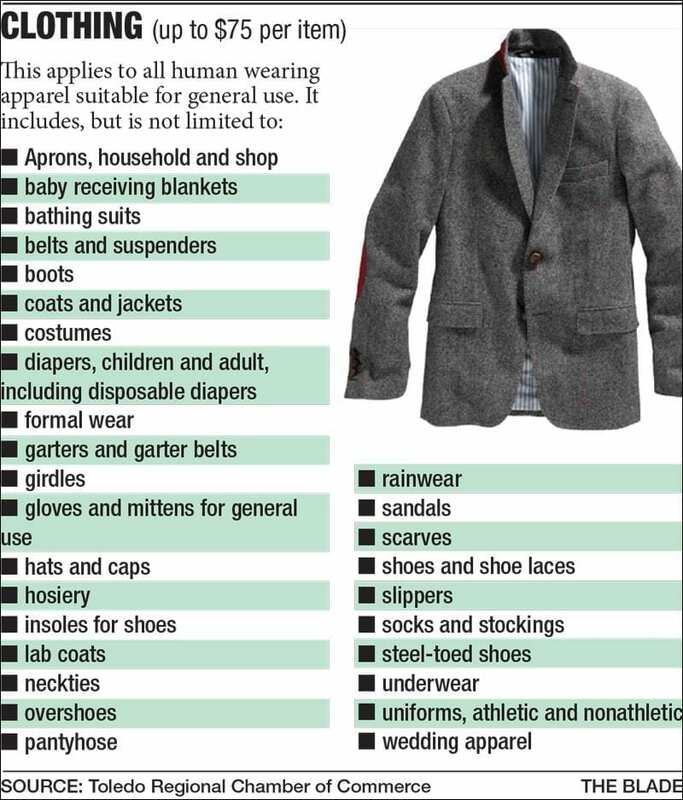 What items at Costume Holiday House qualify for the sales tax holiday? During the holiday, any item of clothing priced at $75 or less is exempt from sales and use tax. 3. What items do NOT qualify? Clothing accessories or equipment.Â Clothing accessories or equipment include: briefcases; cosmetics; hair notions, including, but not limited to, barrettes, hair bows, and hair nets; handbags; handkerchiefs; jewelry; sun glasses (non-prescription); umbrellas; wallets; watches; and wigs and hair pieces. Protective equipment.Â Protective equipment includes: breathing masks; clean room apparel and equipment; ear and hearing protectors; face shields; hard hats; helmets; paint or dust respirators; protective gloves; safety glasses and goggles; safety belts; tool belts; and welders gloves and masks. Sewing equipment and supplies including, but not limited to, knitting needles, patterns, pins, scissors, sewing machines, sewing needles, tape measures, and thimbles; and sewing materials that become part of â€œclothingâ€ including, but not limited to, buttons, fabric, lace, thread, yarn, and zippers. Sports or recreational equipment.Â Sport or recreational equipment includes ballet and tap shoes; cleated or spiked athletic shoes; gloves, including, but not limited to, baseball, bowling, boxing, hockey, and golf; goggles; hand and elbow guards; life preservers and vests; mouth guards; roller and ice skates; shin guards; shoulder pads; ski boots; waders; and wetsuits and fins. 4. Can I buy multiple items, if the total is more than $75? Yes, as long as each item is under $75, there is no limit on the amount of the total purchase. The qualification is determined item by item. 5.Â If I have an item that is more than $75, is the first $75 exempt from taxes? Â No. The exemption applies to items selling for $75 or less. If an item of clothing sells for more than $75, tax is due on the entire selling price. 6. What about sets containing both exempt and taxable items? 7. How are coupons and discounts handled? If an eligible item is discounted to $75 or less, the item will qualify for the exemption. This applies to all discounts even if a retailerâ€™s coupon or loyalty card is required to secure the discount. 8. Does the exemption apply to repairs, alterations, or items for rent? 9. Does the exemption apply to telephone and internet orders? Qualified items sold by telephone or Internet shall qualify for the sales tax exemption if the consumer orders and pays for the item during the exemption period, even if delivery is made after the exemption period.Â However, if the order and payment were made before the sales tax holiday, even if the item was delivered during the sales tax holiday, it would not qualify for the exemption. 10. Does the exemption apply to shipping and handling charges? If all items in a shipment qualify as eligible items and the sales price for each is within the sales tax holiday price threshold, the shipping and handling charges are not taxable. If the shipment includes exempt items and taxable items, the retailer must charge tax on the portion of the shipping and handling charges allocated to the taxable items in the shipment. 11. How should retailers handle exchanges and returns? If a consumer buys an eligible item before the holiday period, but returns the item during the sales tax holiday period and receives credit on the purchase of a different item of eligible property, no sales tax is due on the sale of the new item.Â The retailer must provide the consumer credit for both the purchase price and sales tax paid on the item being returned.